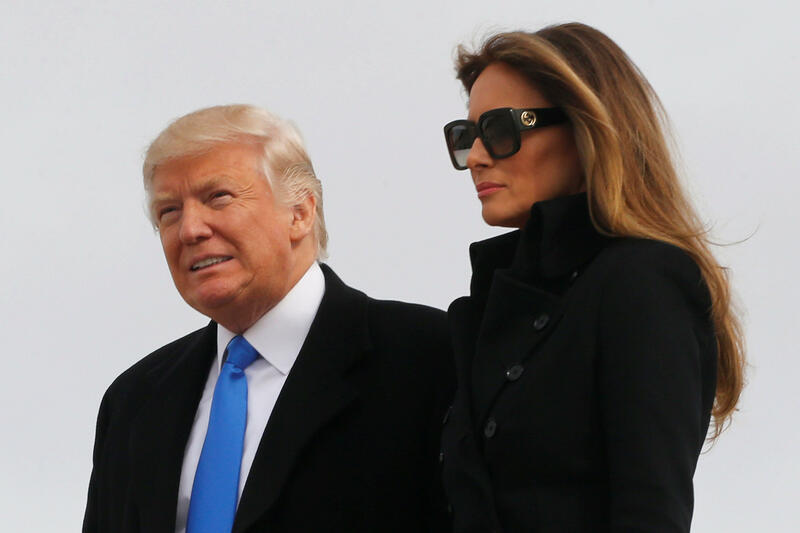 WASHINGTON -- Ready for his big moment, Donald Trump traded in his beloved private plane for a military jet Thursday and swooped into Washington for three days of inaugural festivities. As the president-elect left New York behind, the capital braced for an onslaught of inaugural crowds and demonstrators numbering in the hundreds of thousands. Mr. Trump was already taking on more of the trappings of the presidency, giving a salute to the Air Force officer who welcomed him as he stepped off the military plane with wife Melania at Joint Base Andrews just outside Washington. Meanwhile, the White House was quickly emptying out. President Barack Obama’s schedule was clear beyond his daily briefing and his final weekly lunch with Vice President Joe Biden. Mr. Trump headed straight for his own hotel for a leadership luncheon bringing together inaugural officials, top Republican leaders in Congress, his Cabinet picks and top members of his new White House team. He praised his Cabinet nominees in a speech to the crowd, saying treasury secretary nominee Steven Mnuchin got “grilled” at his hearing Thursday morning and praising education secretary pick Betsy DeVos. “We have by far the highest IQ of any Cabinet,” he said, before the press pool was ushered out of the room. Thursday afternoon, he tweeted that he was on his way. Mr. Trump’s public schedule for the inaugural celebration started with an afternoon wreath-laying at Arlington National Cemetery, where he was accompanied by Pence and Maj. Gen. Bradley Becker. Next, Mr. Trump and his family attended a welcome concert on the steps of Lincoln Memorial ending with fireworks. The two-hour concert, open to the public, featured performances by country star Toby Keith, soul’s Sam Moore, actor Jon Voight and The Piano Guys. Also performing: Lee Greenwood, DJ RaviDrums, 3 Doors Down, and The Frontmen of Country, featuring Tim Rushlow, Larry Stewart and Richie McDonald. Mr. Trump spoke after the performances, thanking his family and thanking his supporters for getting him to the White House. “I’ll see you tomorrow,” he said. He said his supporters were “tired” of the way things were going in the country, and that they’ll see change beginning on Friday. Before departing for Washington, Mr. Trump announced his final Cabinet choice: former Georgia Gov. Sonny Perdue for agriculture secretary. Spokesman Sean Spicer said the president-elect was continuing to make “edits and additions” to the inaugural address he’ll deliver at Friday’s swearing-in. Never mind about Mr. Trump’s gilded private plane: He arrived on a Boeing 757 that is part of the fleet of military planes that become Air Force One whenever the president is aboard. The president-elect, who flew to Washington without any press on his plane, was joined on the trip by a gaggle of his children, grandchildren and other members of his extended family. Also spotted: bags of dresses and formalwear for the coming days’ festivities. He went on to describe Mr. Trump as “part P.T. Barnum” and predicted he would be one of the country’s most accomplished presidents.